The management of Bell palsy is usually quite simple, and doctors have tried many approaches to this illness. Evaluation of individuals who may have Bell palsy requires a good history and physical examination. It especially must include a neurologic assessment in light of the facial alteration which results from muscular dysfunction. Specifically, the clinician has to look closely at the patient’s eyebrows to determine whether it has a sag or droop . The physician will also want to know whether the client has any difficulty when he or she tries to raise the corner of the mouth or pucker the lips. There may also be a flattening of the nasolabial fold of the face, and some people are not able to successfully close one of the eyes. Moreover, those who have Bell palsy may not exhibit any wrinkling of the forehead when they raise their eyebrows . In some instances, there may be wrinkling of the forehead but only on one-half of the face. Another interesting finding is failure of one eye to close like the other one does when the individual blinks . Many medical students remember that the buccinator muscle participates in compression of the cheek against the teeth. This maneuver is common when one has recently consumed a meal and wants to remove food which lies between the cheek and teeth. In clients who have Bell palsy, this muscle may not function well. The physician can test this when he or she asks the person to fill the mouth with air and hold it against resistance . As for the disturbances of taste, hearing, and facial nerve reflexes, there are many tests which specialists can use to further evaluate each of those [1, 2]. Some patients will report that they have headaches, speech difficulty, and hypersensitivity to sound on the side of the face which sags. Additionally, there may be dizziness or problems with the consumption of meals [1, 2]. Physicians are in agreement that the facial sag of this disease almost always occurs on one side. Though it can uncommonly happen on both sides, the presence of a bilateral facial palsy likely suggests some other medical illness [1, 2]. It is obvious from these observations that the medical team may include a primary care physician, eye specialist, ear, nose, and throat physician, and neurologist as these signs and symptoms may overlap with other diseases which, in fact, are more serious than Bell palsy . When this medical condition leads to inability to close the eyes, artificial tears may be helpful during the day, and eye ointment at bedtime also can provide relief. Also, sunglasses in the daytime are useful [1, 2]. The use of botulinum toxin injection has been beneficial for patients who have facial spasm, contracture, or other forms of facial synkinesis which are present with Bell palsy. Synkinesis is involuntary movement of the face—such as the corners of the mouth—when a person blinks the eyes . There is also the possibility that these clients will experience closure of one eye when he or she opens the jaw . Finally, many other treatments have gained attention for this medical condition; however, they remain controversial in the medical literature. These include surgical decompression, acupuncture, antiviral medication, and physical therapy. Hence, the standard therapy of short-course corticosteroids is still the best approach at this time especially when the patient presents to a health care facility within the first three days of the illness onset [1, 2]. The evaluation and management of this disease requires careful assessment from at least one physician. When the diagnosis of Bell palsy is correct, the outcome for the patient is generally quite good. Patel, D. and Levin, K. (2015). Bell palsy: Clinical examination and management. Cleveland Clinic Journal of Medicine, 82, 419-426. National Institute of Neurological Disorders and Stroke. (2003). Bell’s Palsy Fact Sheet. Retrieved March 26, 2016. 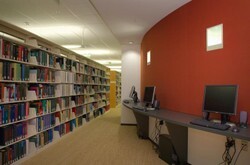 The photo is of a library at the United States Centers for Disease Control and is reprinted with permission from that organization.